Last week in FuelSmart Part 1 we introduced a revolutionary DIY fuel saving device. And unlike most other devices that claim to greatly improve fuel economy, there’s no shonky science behind this one. It works best in manual transmission cars equipped with a MAP sensor. FuelSmart is an electronic module that monitors two engine management sensors - the throttle position sensor and the MAP sensor. By doing this it can sense when the engine is working in a way that is likely to result in poorer fuel economy. Specifically, when the throttle is open but the MAP sensor indicates that engine vacuum is above a preset level, a dash LED is illuminated. If the FuelSmart LED is on, you should immediately assess your driving style. In constant load, light cruise conditions, the FuelSmart LED will stay on – but that’s because in these conditions the engine is actually not working at its fuel-efficient optimum. If you are already in top gear, there’s nothing much more you can do. But if you’re not in top gear, the LED is a reminder to change up and then use more throttle to maintain speed. The improvement gained in fuel economy depends on a number of factors – the terrain, average speed, constancy of that speed, the ability of the driver and how the FuelSmart module is calibrated. It also depends on the car. However, in back-to-back testing over the same urban route, we saw a repeatable 15 per cent fuel economy improvement – and that comparison was with a well-driven car! By watching the LED and driving accordingly, a driver not used to driving for fuel economy could gain far more improvement than 15 per cent. FuelSmart is based on an electronic module produced by Australian electronics company, eLabtronics. It uses a custom programmed microprocessor, a dash-mounted LED, two set-up pots, one remote-mounted fine tuning pot, and a pushbutton. It costs AUD$45 (+ GST for Australian buyers = $49.50) and can be bought directly from eLabtronics – see the link at the end of this article. FuelSmart needs four connections to the car’s engine management system – ground, 5 volt supply (note: NOT 12V! ), MAP sensor and Throttle Position Sensor (TPS). 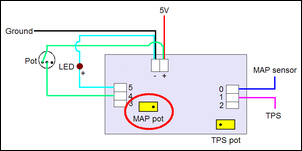 The MAP and TPS sensors need to have voltage outputs in the range 0-5V. The TPS must have a voltage output that rises with increasing throttle opening (every TPS we’ve ever seen does this), and the MAP sensor output must rise with increasing absolute pressure (that is, decrease in voltage output with increasing ‘vacuum’ – again, they pretty well all do this). All the ECU connections should preferably be made at the ECU, but they can also be made under the bonnet at the actual TPS and MAP sensors. These sensors nearly always have a 5V supply and so the 5V connection that powers the FuelSmart can also be made at one or other of the sensors. If no 5V supply is available on any of the ECU sensors (and that would be a very rare car indeed! ), an external regulated 5V supply will need to be used. (Cheap and Easy 5V Supply shows you how to adapt a phone charger to achieve this.) Do not try to power FuelSmart directly from a 12V source! The ground connection can be made at a sensor or simply by connecting to the chassis. Note: eLabtronics will supply FuelSmart with the remote pot and dashboard LED already wired to the module, using 2-metre lengths of cable. That means you need connect only four wires. If you are unsure about making these connections, any auto electrician should be able to do the work in well under an hour of labour. 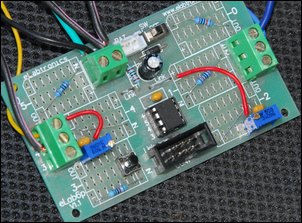 The auto leccy doesn’t need to install the LED, mount the module, etc – just make the ECU connections. While we haven’t trialled the FuelSmart on an auto trans car, we think the device would still be useful in that application. It would quickly indicate when acceleration up through the (automatic) gears was occurring too leisurely, and would also show when inefficient ‘trail’ throttle was occurring – that is, rather than lifting right off, the driver maintains some throttle as they slow. After it is wired into place, FuelSmart needs two settings calibrated. These calibrations are easily done, and the settings can be changed as often as you like. The board should by now be wired to ground, 5V supply, TPS signal and MAP signal. The LED should be located where you can easily see it while driving, and the remote mount pot should be within reach. In addition, you should have available a small screwdriver to adjust the on-board pots and an assistant to do this while the car is being driven. Note that the underside of the bare circuit board should not be allowed to come into contact with any metal surfaces – it’s fine resting on the lap of a passenger or on a seat. 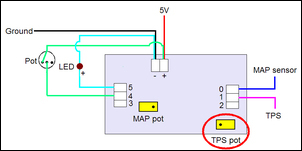 In this diagram the TPS setting pot is highlighted. With the car stationary and idling, press the button on the FuelSmart board. Keep the button pressed until the dashboard LED flashes an acknowledgement. Release the button. The FuelSmart is now in ‘TPS Setting’ mode. Press the throttle down a tiny amount, until engine revs just start to rise. 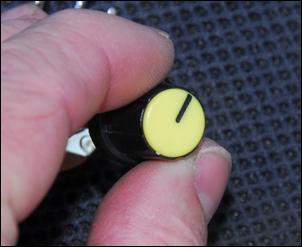 Turn the TPS pot (use a small screwdriver – it may take lots of turns) until the dash LED just comes on. Adjust the pot until when you release the throttle, the LED goes off, and when you just press the accelerator pedal a tiny amount, the LED goes on. Turn off the ignition for at least 2 seconds - this step switches off the ‘TPS Setting’ mode and reverts the module to standard mode. 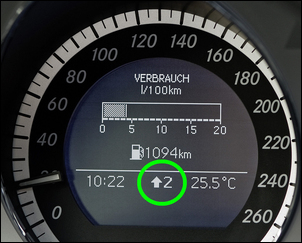 Note that the module needs to lose power to reset it to standard mode – some cars keep their ECUs energised for a short time after key-off. In this diagram the MAP setting pot is highlighted. Set the remote mount pot to about the middle of its travel. Test this setting by accelerating through the gears. At low revs, the dashboard LED should stay on until about half throttle is reached. The next step is to drive the car in a variety of situations – urban open road, heavy traffic, hilly terrain. If the dash LED is on and you’re not already in top gear, change up a gear. Does this then cause the car to stumble and lug – the gear change is obviously too early? If so, the MAP set-point of the FuelSmart needs to be reset at higher rpm (eg with the car at half throttle, using 2500 rpm rather than 2000 rpm). Alternatively, does the LED indicate up-changes that are too late – when you change up a gear, the engine easily pulls the car along on only light throttle? In that case, the MAP set-point needs to re-done using lower rpm. The optimal setting is one that requires at least half throttle travel to be used in each gear as you accelerate up the gears – otherwise the LED comes on. It lets you make easy on-the-move adjustment of the MAP trigger point. To cater for different driving styles. For example, sometimes you might want to have the pot set so that you can drive pretty normally – or at other times, you might want it set to allow optimal pulse-and-glide driving. The pot also allows easy adjustment to suit different drivers. If you drive up or down a large mountain, the change in atmospheric pressure is sufficient that that the optimal MAP setting point may actually alter. The remote pot allows you to easily cater for this change. The optimal setting for the MAP LED depends on the engine’s Brake Specific Fuel Consumption map. As shown in Brake Specific Fuel Consumption, these maps vary from engine to engine. However, in most cases, the combination of high load (ie plenty of throttle) and low rpm is the ‘sweet spot’ for fuel economy efficiency. The rpm point (and so the manifold pressure achieved at half throttle) that is used during the FuelSmart MAP set-up process will depend on the torque characteristics of the engine - smaller naturally aspirated engines will need more rpm than larger engines. Modern turbocharged engines, that develop excellent low-down torque, may need lower rpm – eg the rpm at which the turbo is first up to full boost. This can be as low as 1500 rpm. By doing some careful testing and altering the MAP set-point, the FuelSmart can be ‘tuned’ in its operation for any engine. For hypermilers, a proper test regime can be implemented where the MAP set-point is trialled across a variety of settings and compared with actual fuel economy achieved at those settings. When calibration is finished, the FuelSmart module can be placed inside a plastic ‘jiffy’ box, or simply wrapped in tape or heatshrink, and placed up under the dash. Even if the sensor and power connections are made in the engine bay, the FuelSmart unit should be mounted inside the cabin of the car. Aim for a driving style that keeps the FuelSmart LED off as much as possible – especially when accelerating up through the gears or slowing. In addition to the FuelSmart LED, when driving for economy you should also use the tachometer. Keep the revs as low as possible – in other words, change-up early. Some of you may be saying – so why not just use the tacho by itself? In driving reality, the FuelSmart LED lights up in lots of situations where the tacho is of no use – eg slowing for a traffic light where you’ve left your foot a little on the throttle (so wasting fuel); maintaining station in slow-moving urban traffic, where the LED shows that you’re a gear too low for best fuel economy; and accelerating away from a stop, where the LED shows when insufficient throttle is being used. And, as with any car instrument, the FuelSmart LED needs to be used intelligently. Inevitably there will be situations where you ignore the action of the FuelSmart LED – when it lights, it is an indication that you should assess your driving style at that particular moment, not always change it! But even with FuelSmart set up as a gentler indicator of inefficient driving (ie you’ve got to be doing things really wrong before you get a LED indication), you will still save fuel. If a dashboard indicator of the FuelSmart sort works so well, why don’t manufacturers install such a device? In short, some do. Car makers are increasingly installing ‘driver economy indicators’ – these vary from displays as elaborate as a colour LCD showing a virtual ‘vine’ that ‘grows leaves’ when the driver is operating fuel-efficiently (and loses leaves when they aren’t) to ‘up-change’ and ‘down-change’ LEDs indicating appropriate gear-changes. Shown here is the gear-change indicator in a late model diesel Mercedes. The hybrid first generation Honda Insight, owned by the author, has up-change and down-change gear shift indicators on the instrument panel. Perhaps because of the ability of FuelSmart to be easily fine-tuned, better fuel economy results were achieved using the FuelSmart LED than the factory up/down indicators.